Welcome to the Great Hospital website. It has been designed to guide you through the medieval and later history of this fascinating building, and, with the aid of video models, to show you what it might have looked like during its heyday in the fifteenth century. 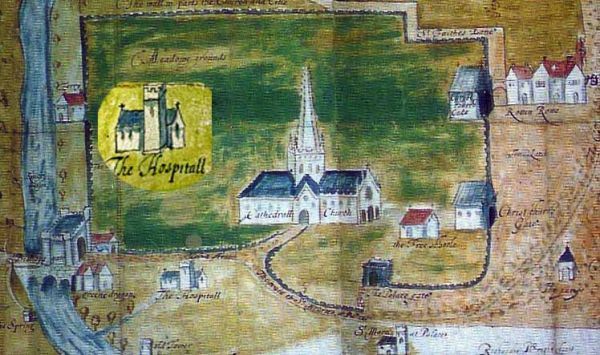 In 1249, Bishop Walter de Suffield founded the Great Hospital at Norwich. The hospital, which is situated in a bend of the river Wensum to the north-east of Norwich Cathedral, has since cared for the people of Norwich for over 755 years. In fact, over a thousand hospitals were founded in medieval England, yet very few survived the upheavals of the Reformation. Indeed, only the Great Hospital, which is now a retirement home for the elderly, has retained both its medieval fabric and a major archive. The availability of both enables us to recreate, in remarkable detail, an impression of life in one of the city's most fascinating but hitherto neglected institutions, and to discover exactly how the building would have appeared during its heyday in the fifteenth century. If you want, you can find out how it would have looked then right now, by clicking on Exploring. Or you can read on to find out a little bit more about why we have created this website. We think that the Great Hospital is a very special place. It is where the past and present come together. 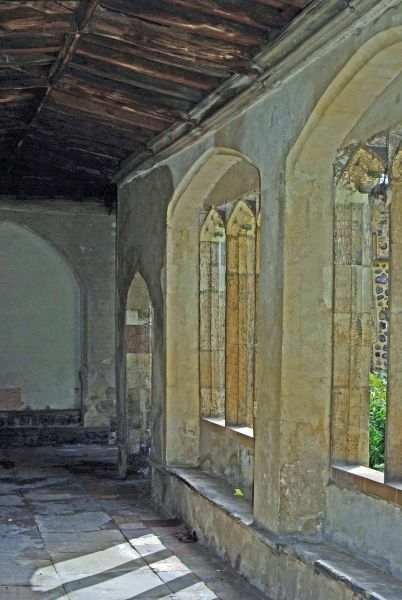 It is also quite exceptional, too, given its almost unparalleled record of care, the range of existing medieval buildings which are still in use, and extensive archives. Yet, even in East Anglia, this remarkable institution remains little-known outside the academic community. That is why medieval scholars and IT specialists at the University of East Anglia (Norwich), assisted by the generous support of national and local sponsors, have drawn on their collective knowledge to bring you this website. It is designed both to widen awareness of this important building and provide an easy, accessible guide to the hospital's medieval history (while also tracing its more recent history too). Pictured above: The Cloisters at the Great Hospital. Photographer: C. Bonfield. It has also been created as an educational resource to be used by specialists and non-specialists alike. So, if you are someone with a general interest in Medieval history, a student, or even an academic historian, there will be something for you on this site. But whoever you are, we hope that by exploring this site you will come to realise why the Great Hospital is considered to be one of Norwich's twelve 'Great and Good' heritage sites - and that you too will want to find out more about the fascinating story it has to tell. This website has been designed to guide you through the early history of the Great Hospital, step-by-step. The website itself is divided into four parts: (1) History (2) Exploring (3) Resources and (4) Links. Here you will learn what the hospital was like in the Medieval period. You will discover who founded it; how patients were treated; why it then had no doctors; and the importance of the high altar. You will also learn about the Reformation, what the hospital was like during its Middle Years, and what it is like now. With the aid of several video models, you will discover for yourself the history, architecture and decoration of the Great Hospital. One video even allows you to pause on your journey and learn more about the hospital's past. Here you can view medieval documents, translations and images. Find out what the foundation charter was, read Bishop Suffield’s will and compare images and transcripts of Alderman Codde’s account of 1548-9. The final part of the site provides suggestions for further reading and provides links to other interesting websites. It also tells you who helped fund this project, and who was responsible for its creation. Please remember, however, that if at any time you want to return to the homepage you have only to click on the hospital logo in the top left-hand corner. Or, if you want to jump to another part of the site, just click on one of the headings above.